It's what I expect a fine tip pen to look like. So I'll pretend I never saw the words felt tip otherwise I'll not sleep for days due to extreme confusion. Putting all that aside, I actually really love these pens. I don't know what it is about a fine tip pen that makes me want to write in a slow, gentle way. The thin lettering makes even my scruffy handwriting actually look rather nice. The nib does feel quite delicate to begin with. I was frightened to press too hard for fear of damaging it but I needn't have worried. 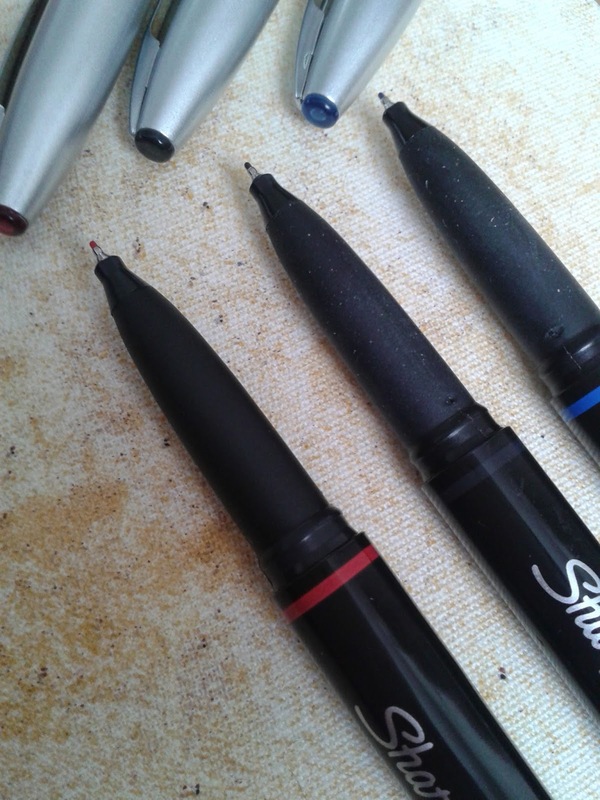 After a week and a half of use, I was using them just like any other pen and they are still intact. And believe me, they have been used alot. I used nothing but these babies. I can't seem to put them down. The soft and smooth rubber grip is comfortable to hold. They are so light weight I barely even notice I'm holding a pen at all. Considering I paid £3 for the set, I'm over the moon with them. And just in case I have any trouble seeing what colour they are, they've been colour coded three times. One strip round the barrel and one on each end which I can't help but think belongs on a Lego vehicle or something. Lost a piece from your Lego model? Its on my sharpie. The lids are very secure. It's like a little vacuum in there and when they do come off they make the most satisfying POP sound. Its awesome. The ink colour was a little disappointing. Not because I didn't like it. Its nice. Its just that I was expecting "vibrant colours" and got wishy washy. The colours actually look darker in the photo than they do in natural daylight. Wishy washy isn't necessarily bad. The colours are still pleasing to the eye, just in a gentler way, rather than a vibrant way. 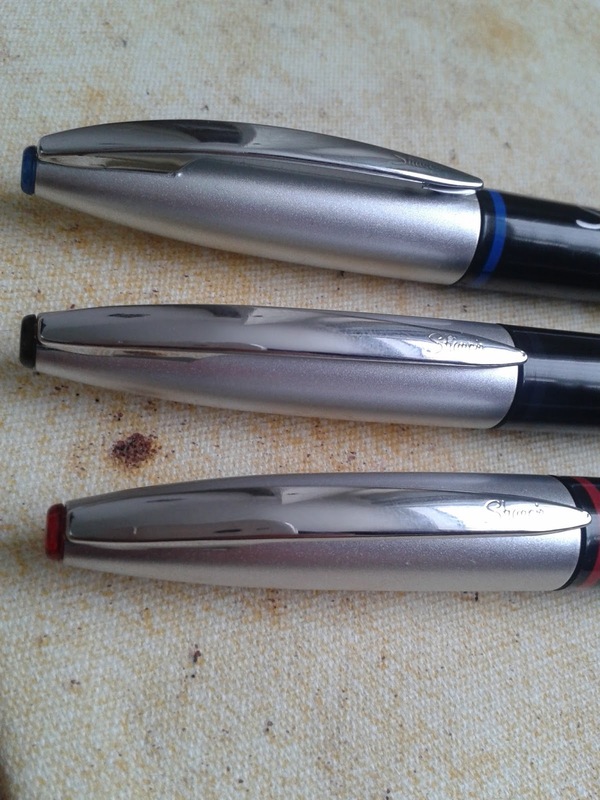 I very nearly snapped one of the pens trying to open it to look at the refill and failed. 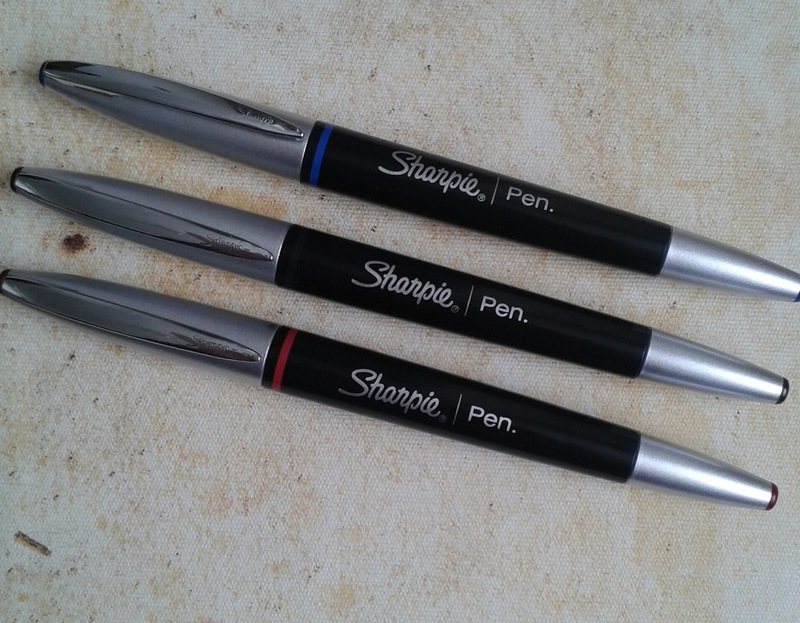 As far as I can tell, the pens do not open up and are not refillable which is a shame. I'm pleased I have these pens. 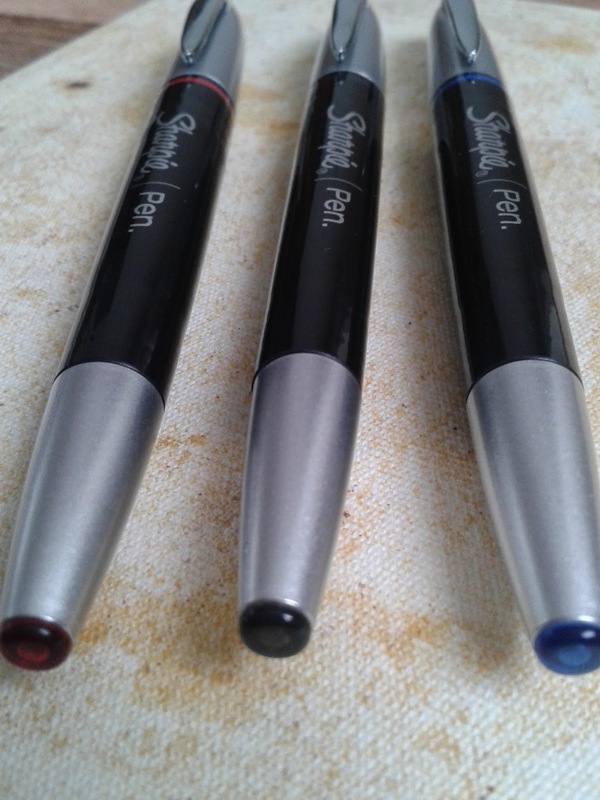 They are lovely to use and when the ink does run dry I'll probably have a little cry and then go out and buy a new set. I'm shopping for a new school bag for my son. It has to be black, preferably Nike, no weird colours. I've scoured the shelves of 3 sports shops already, I'm fed up, I hate shopping at the best of times and here I am in Sports Direct. They have the bag. Its black, its Nike and theres no weird colours. The queue is massive, the till staff are working at their own leisurely pace and I need a wee. Its my turn to pay. I'm offered the massive bag for life. No thanks but thanks for asking. 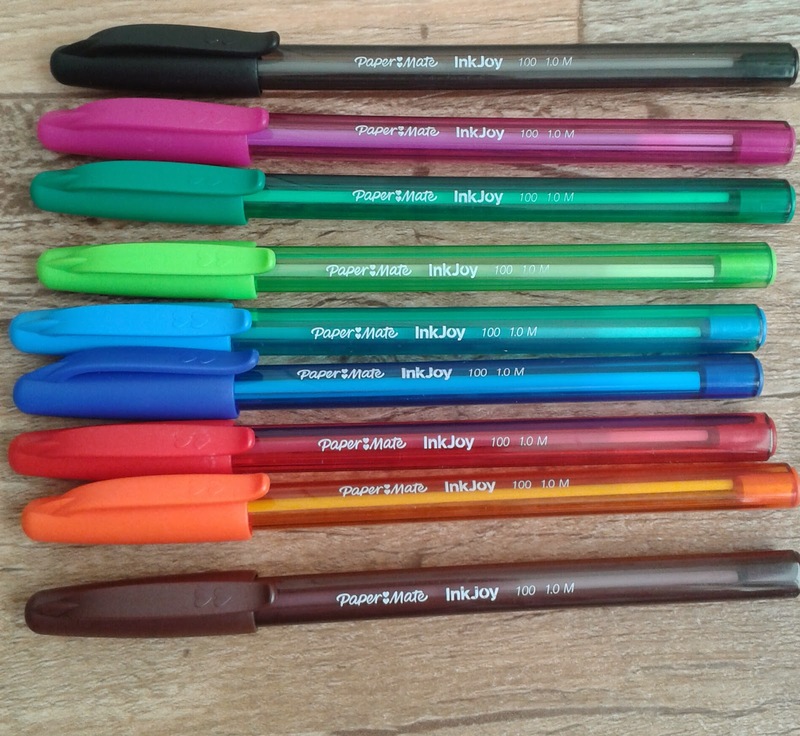 And there they are, the pens, the only thing I actually don't mind shopping for. I pick up a set of 3. "I'll have these as well please" The till op looks surprised. I'm guessing by the full pen box that they're not exactly bestsellers. I go home pleased with my unexpected purchase and quite happy I had to go shopping for a bag! For 69p for the three, I wasn't expecting a great deal, and not a great deal is exactly what I got. 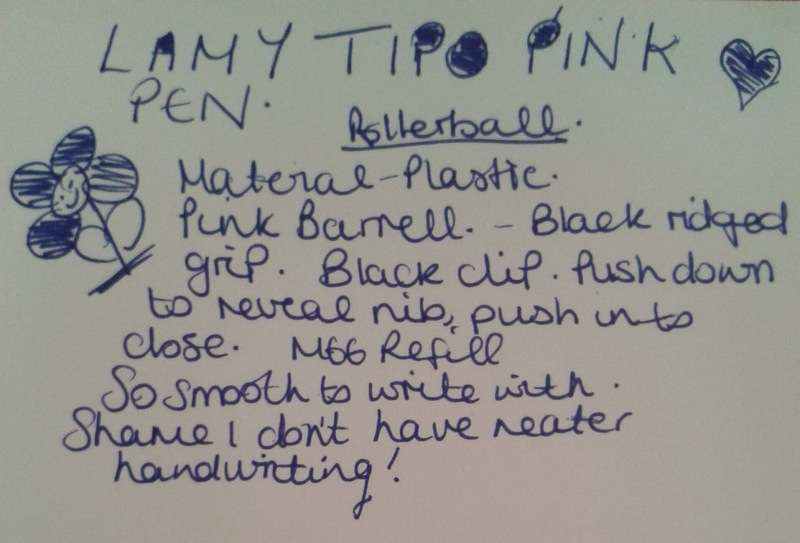 I had to change the refill in the blue and black pen straight away as the ink was dry. Apart from that, the pens are fine. They are just your average ballpoint pen, but I couldn't help myself. I have a soft spot for promotional pens. However crappy they might be. I bought my very first Lamy this week. At £5.75 its at the lowest end of the price scale. The entire pen is made of plastic. 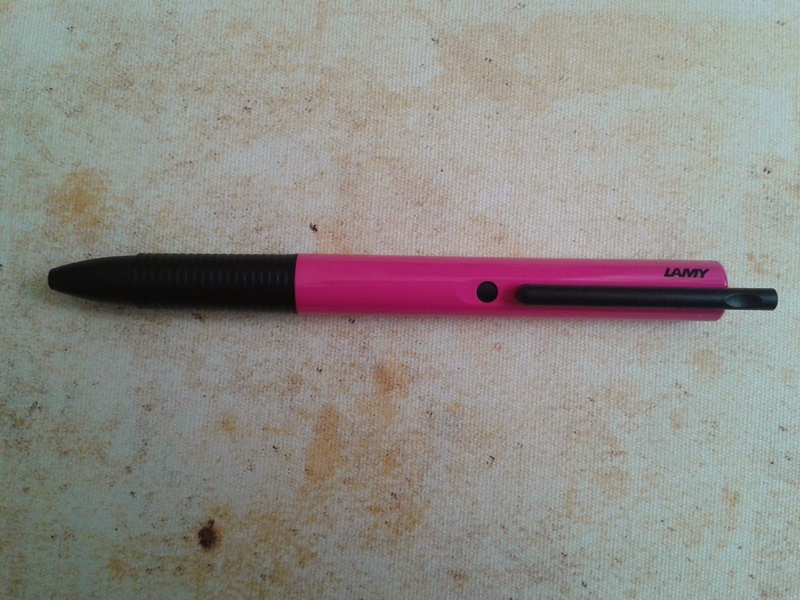 It has a pink barrell, with a black ridged grip and a black clip. To expose the nib you press the clip down and to hide it you press the clip in. The clip is unclippable unless you retract the nib which can only be a good thing as it stops you from accidently marking your clothes or pockets or the inside of your handbag which is a regular occurance for me. 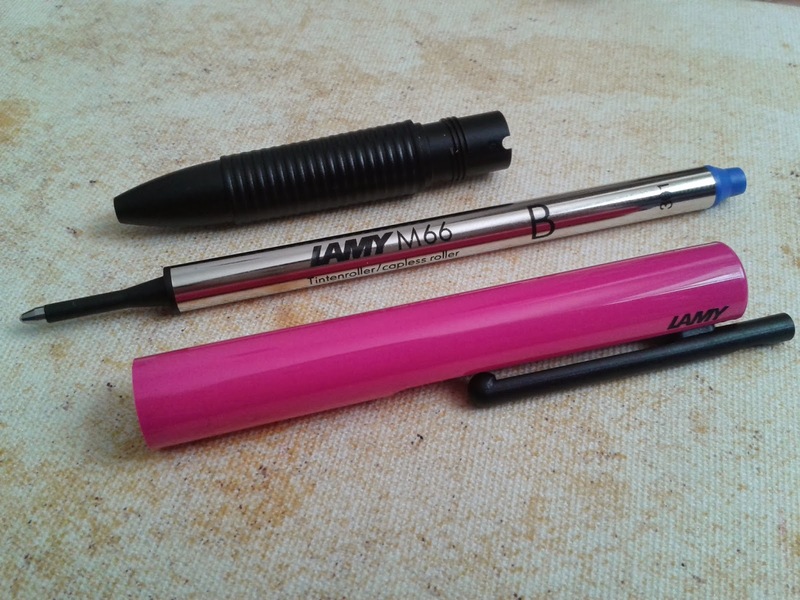 The pen uses a Lamy M66 refill and is easily replaced by unscrewing. Writing with this Lamy is an absolute pleasure. 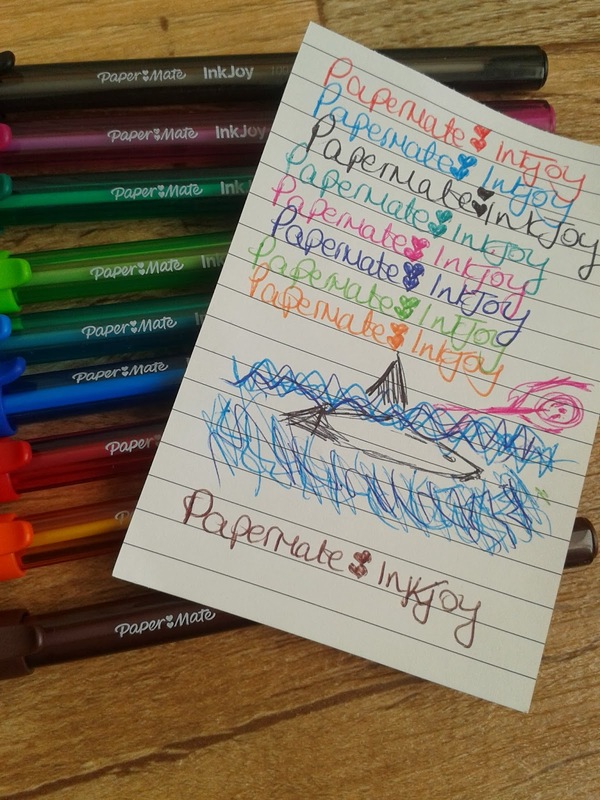 It glides effortlessly across the page becoming one with the paper. It almost feels spongy but in a good way. The refill is a medium point and I do think my writing looks quite thick. Its not too thick though that its a problem if you have really small handwriting. I still got good clear lettering. One small issue though - The grip can become a little uncomfortable after a while. I dont know if its because the ridges are plastic and quite deep or if its just the way I hold the pen. After just a few minutes of writing it felt like it was digging in and left marks on my fingers. Perhaps I was gripping it too hard? I only mention it because most pens I use enable me to write comfortably for a long period of time without these comfortableness issues ever crossing my mind. Despite the grip issue, I really like this pen. Its a pen I'd be happy to keep in my handbag for everyday note taking and list writing and so on. A great all rounder. Every year on his birthday, along with his cool presents, my son gets some stationery. Mainly because he's less likely to steal my pens if he has his own and secondly because I can't resist a pen buying opportunity. Like me, he enjoys doodling in his notebooks and writing stories and there are some fabulous doodleworthy colours in this set so I had to test them out for myself. As you can see, my doodles are appauling. A shark with its tail on backwards and a man desperately trying to swim away, just in case you didn't get it! The pens are triangular shaped. I'm used to round pens so did think it strange, until I started doodling. It didn't take long to understand the benefits of the triangular shape. Its comfortable to hold providing you grip the pen from the right angle. You'll know if you're not. The 3 sides give my fingers more surface area to grip without squeezing too hard. The ink flow is smooth and constant and the colours are bright. I love the trademark hearts on the lids. 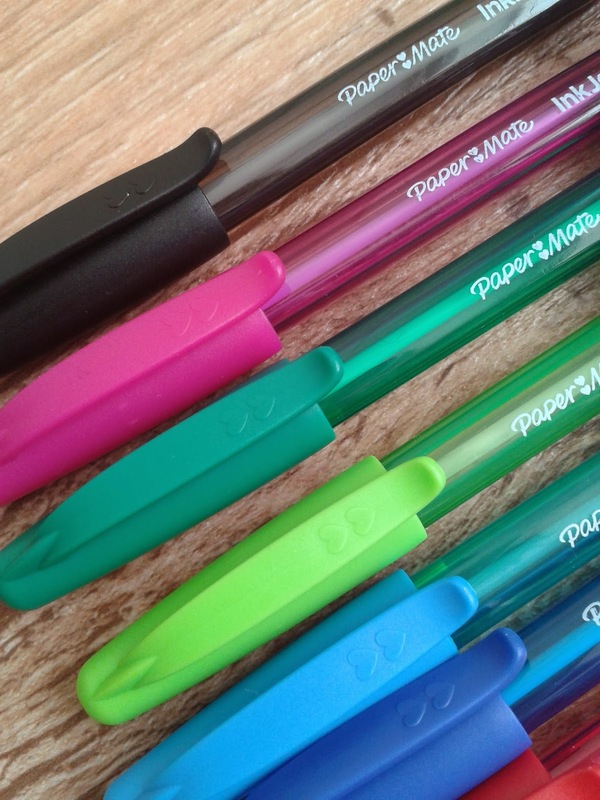 I love the small details that give the pens a bit of a feminine feel but they blend in just enough so that my son didn't even notice or care about them. I'd have carried on drawing ridiculous things all evening if it wasn't for my son swiping them away. He said I was enjoying them too much and that I had plenty of my own if I wanted to carry on drawing rubbish pictures!